Kundalini energy is said to be the force of life! All disciplines of Yoga are designed to unleash this power. When unleashed the Yogi becomes a "seer" into the nature of reality otherwise known as enlightenment. He acquires superhuman powers on the release. The energy is represented as a coiled serpent that sits in base of the spine. This serpent bursts free and crashes through the crown of the head out into the universe leaving the recipient enlightened. Of course, we at Death before Dishonour chose to illustrate the final acquisition in a deeply macabre manner rather than angels, harps and tunnels of light!! 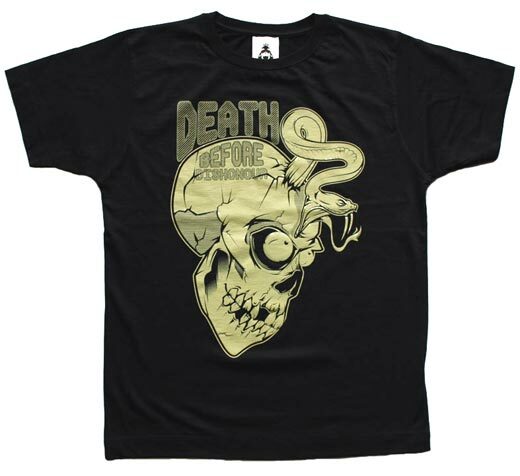 Printed in the UK on sweatshop free, high quality combed cotton, heavyweight tees and sweats, available in various colour ways from Death before Dishonour.